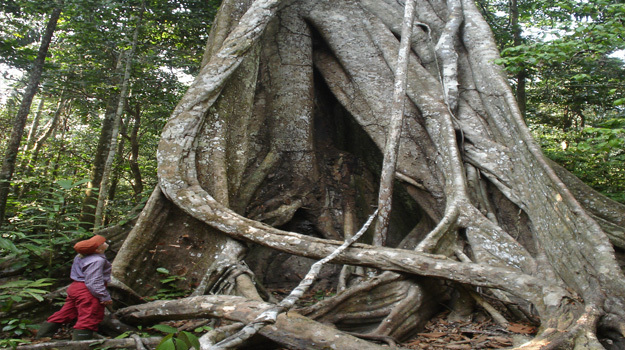 This research project seeks to identify the sources and sinks for atmospheric carbon dioxide over the Amazon basin. This is done neatly by measuring the atmospheric CO2 concentration in the high atmosphere before the air enters the Amazon, and after when it is deflected by the Andes and exits in SE Brazil. My role here is to provide an inventory for the contribution to atmospheric CO2 from river systems draining the Amazon Basis and I am doing this with Dr. Leena Vihermaa who is working on the project from July 2010-June 2013. 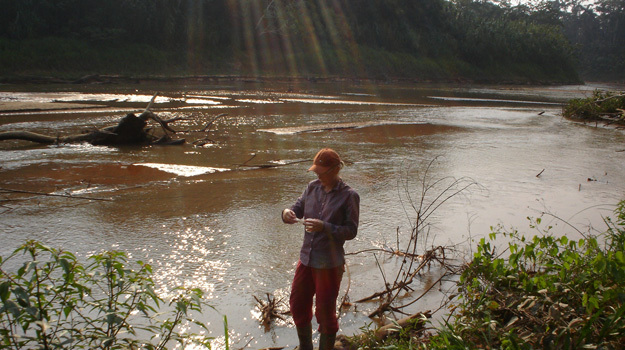 Leena has spent large amount of her time in the far west of the Amazon Basin, in Peru at Tambopata National Reserve, where we find more nutrient-rich soils researching C balance under higher nutrients. Additionally at this site there is an eddy-covariance tower to quantify atmospheric emissions from the forest. The reach of this tower is such that it will accommodate within its measured budget CO2 flux from small streams, so our work quantifying the riverine fluxes will allow this to be subtracted from the total and produce the forest efflux only. By combining our C export data with the flux tower estimates of C storage we can produce a detailed carbon budget for the site. Furthermore, we will obtain information on the magnitude of the riverine contribution in the Amazonian carbon balance, in particular relating to the significance of small streams which have received less attention in the past. 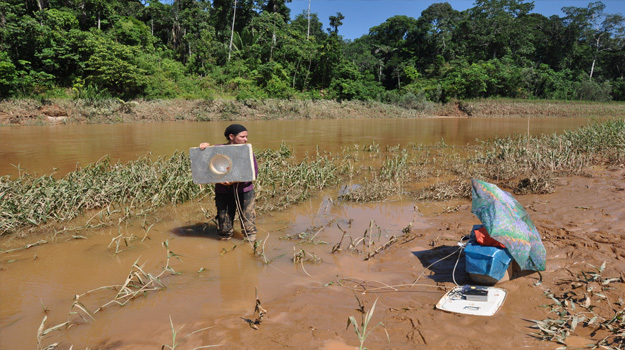 Our colleagues in Alex Krusche’s group at CENA, Brazil, have worked on the upscaling the CO2 fluxes from larger rivers across the Amazon basin. This research project is funded under NERC’s Knowledge Exchange scheme, a funding initiative which seeks to link the knowledge of academia with those best placed to benefit from gaining that knowledge. 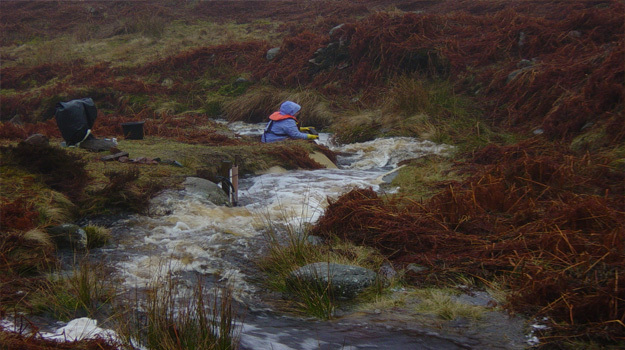 In devising this project (myself, and from Stirling University, Dr. Ian Grieve and Prof. Dave Gilvear) considered that there was a wealth of knowledge within the UK academic network as to the processes that control the delivery of carbon from terrestrial landscapes to aquatic drainage systems. Important here is that disturbance of the landscape can enhance transfer of C to the drainage systems. An anthropogenic activity important currently that may cause such disturbance is the building of windfarms. These are often cited on our most carbon rich soils as these are often the most windy places on the UK mainland. We three are leading the UK on research on the impacts of windfarms on carbon rich soils (Waldron et al., 2009; Grieve and Gilvear, 2008). Thus this funding allows us to form a network integrating academic research with C landscape stakeholders, to provide an understanding for those who have to manage a C landscape of how C is transferred to the catchment drainage and how to minimise this transfer. This understanding will be formalised by network production of the Carbon and Water Guidelines, a publicly accessible document that will be hosted by the CLAD webpage. To facilitate and manage this network we appointed Dr. Simon Drew. This NERC-funded research is part of a large consortium project led by Prof. Stephen Mobbs to downscale climatic predictions and in our work-package consider the impact that a wind farm has on the underlying capacity for the soil to sequester C. Our premise here is that for the turbines to generate electricity their rotation must remove energy from the landscape and thus wind speed at the ground level is reduced and turbulence is generally increased. These changes in wind affect the energy balance of the system and lead to changes in temperature, and potentially evapotranspiration. Given that both temperature and soil moisture are known controls on carbon cycling, both gaseous and aquatic, the carbon cycling is hypothesized to be perturbed by the installation of wind farms. 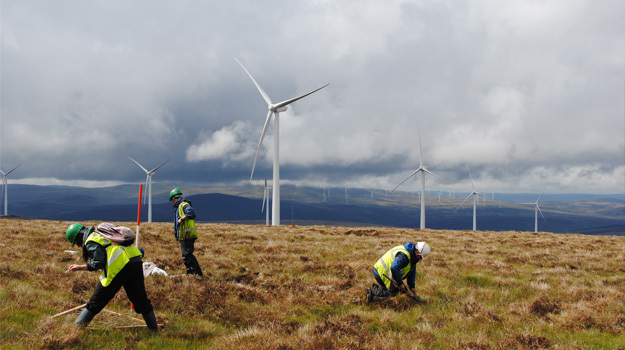 Given the correlation between carbon rich peatland environments and the distribution of wind farms in Scotland the effect on carbon sequestration could be notable. Existing studies have demonstrated significant effects on temperature, in the order known to effect carbon cycling (Baidya Roy & Traiteur, 2010; Zhou et al. 2012), however, this study is the first to examine the consequent effects on carbon cycling. Further information about the large microclimates project can be found here. 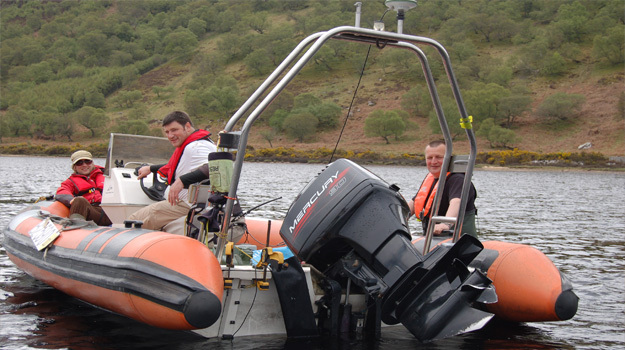 This NERC_funded United Kingdom Lake Ecological Observatory Network uses automated sensor technology to collect high frequency data from 11 lakes within the UK. 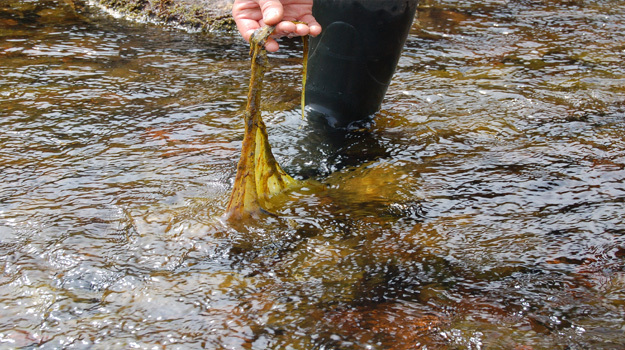 The aim of the project is to provide means for real-time forecasting of algal blooms, to understand the effect of meteorology on carbon dynamics and to understand the coherence in lake responses across the network. The Glasgow University team (myself and Dr. Leena Vihermaa) is responsible for the instrumentation of Loch Lomond. The monitoring buoy at the site is recording meteorology (wind, atmospheric pressure, light, temperature) and water chemistry (conductivity, pH, dissolved oxygen, dissolved CO2, chlorophyll a and water temperature) every 15 minutes. 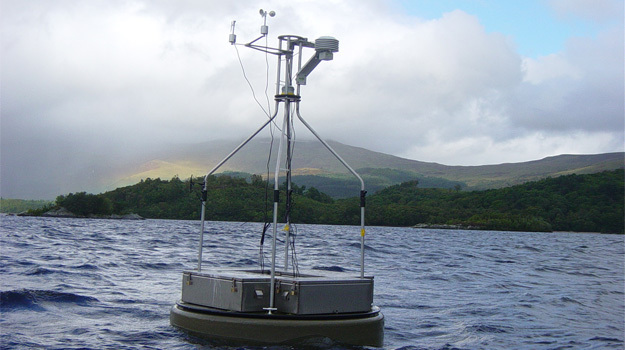 The main focus is to understand the capacity of lakes to emit CO2 and high resolution data collected by the monitoring buoy provides powerful means of developing CO2 efflux models and understanding the controls in detail. 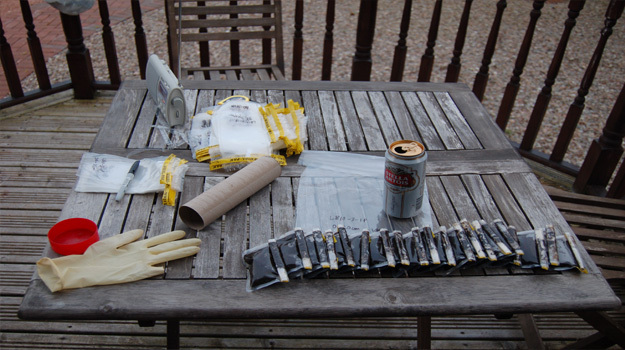 In addition, sediment traps are deployed to study particulate carbon deposition and samples of dissolved organic carbon (DOC) are collected during the monthly maintenance visits. Sedimentation rate is an important measure of how much carbon will be delivered to the bottom sediments, whereas DOC concentration yields information on the amount of organic material potentially available for respiration or photo oxidation, which could increase CO2 concentration and hence the capacity for efflux. Understanding the meteorological controls on the aquatic CO2 concentration and the resulting efflux from the lakes is essential for understanding the lake behaviour under climate change. Listed below are Carbon Landscape relevant Geography and Earth Science degree honours dissertation projects that I have supervised. 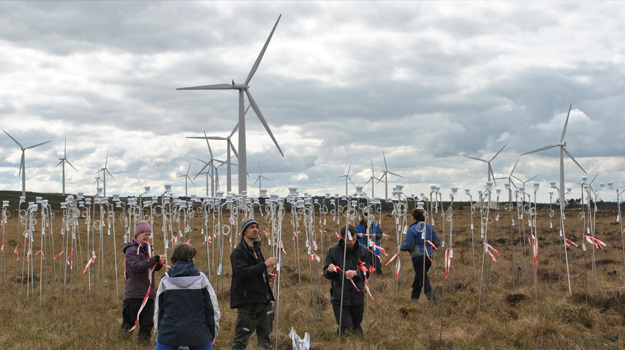 Magdalena Matysek (2012): Does the presence of a wind farm affect the vegetation distribution on a peatland? Victoria Lawns (2010): How important are urban river systems in exporting carbon? Stuart McKenzie (2013): The public awareness of green tax subsidies in utility bills and the commitment to support renewable energy and climate change.